We apologize that you haven't heard from us in sometime, but now that we have "gotten our feet on the ground" here in Tanzania, we hope to be writing more often to let you know about what we are doing here, and, more importantly, what the church is doing in East Africa. 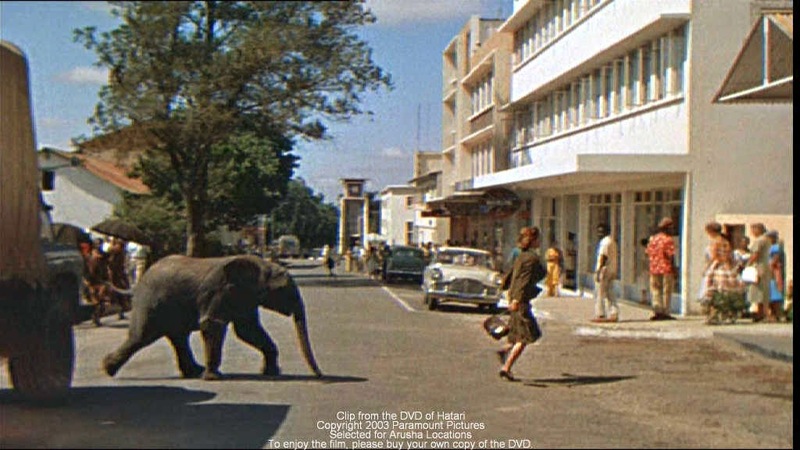 Recently we saw the 1962 movie Hatari! starring John Wayne as the safari leader on the northern Tanzanian plains capturing animals to send to zoos. I saw this film when I was a kid, and I still remember the exciting rhinoceros chase sequences. Part of the film takes place in the town of Arusha, our new home in Tanzania. If you are not sure where Arusha is located, the famous clock tower (in the middle of the photo above) is located half-way on the road from Cairo to Cape Town. It is amazing how we can recognize certain local landmarks in the film more than fifty years later: the clock tower, just 50 yards from our office in the Lutheran Center, and, a few blocks from there, the Lutheran Cathedral, which looks brand-new in the film, but hasn't substantially changed since that time. Our new calling as East Africa Regional Representatives involves a lot more than water projects and theological schools, which were our main focus in the Central African Republic. We still miss the CAR and the students, friends and colleagues we left behind there—but we are happy to be serving in a different role here in Arusha, and throughout the region. We are responsible for representing the ELCA in four countries: Tanzania, Kenya, Uganda, and South Sudan, although we haven't yet had the chance to visit South Sudan due to the conflict that has been ravaging the country for almost a year. So what do Regional Representatives do? We visit projects supported by the ELCA, read reports, proposals and budgets from these projects, visit with local church leaders, encourage our local ELCA missionaries and volunteers, and represent the ELCA at local and regional church meetings. Often I hear someone from one of our partner churches say, "We know that the ELCA cares about what is happening here because you always send someone to our meetings!" Perhaps letting people in East Africa know that the ELCA cares about what is happening here—in their country, in their church—is the most important thing that we do. And, of course, we want all of you to know what the ELCA is doing in East Africa—a huge area with well over 6 million Lutherans just in the four countries Joe and I work in. That's twice the number of Lutherans in the ELCA! So there is a lot going on here and we hope to share some of it on this blog. Photo Credit: Clip from the movie Hatari! The movie starred John Wayne and filmed in Tanzania. The shot is taken looking south on Boma Road toward the clock tower. Our office is behind the tree. The baby elephant is headed for the Safari Hotel, which has now been replaced by the New Safari Hotel.